Massimo Bottura of Osteria Francescana celebrates the first place in the ranking with the bubbles of Ferrari Trentodoc. In Italy, it was still the middle of the night when the meeting gathering in Cipriani Wall Street in New York and joining more than 800 influential people of the international restaurant industry stood up to give a round of applause to Massimo Bottura and his Osteria Francescana, a restaurant headquartered in Modena that climbing to the top of the 2016 ranking of The World's 50 Best Restaurants. Nevertheless, in just few minutes, a deluge of tweets, Facebook posts and Instagram pictures spread the rumour in the newsrooms of the entire world, showing an excited Bottura on the stage, waiving an Italian flag and giving a speech where he recalled that success “requires hard work” and that “the ingredient we need for a prosperous future is culture. Culture is the driver of knowledge and knowledge is the driver of awareness and responsibility”. Culture is indeed one of the main elements of the heritage of Italy, a country that after 15 years has climbed back to the top of this prestigious ranking, conquering other valuable positions thanks to the work of Enrico Crippa of Piazza Duomo, the Alajmo brothers of Le Calandre and Davide Scabin of Combal.zero. 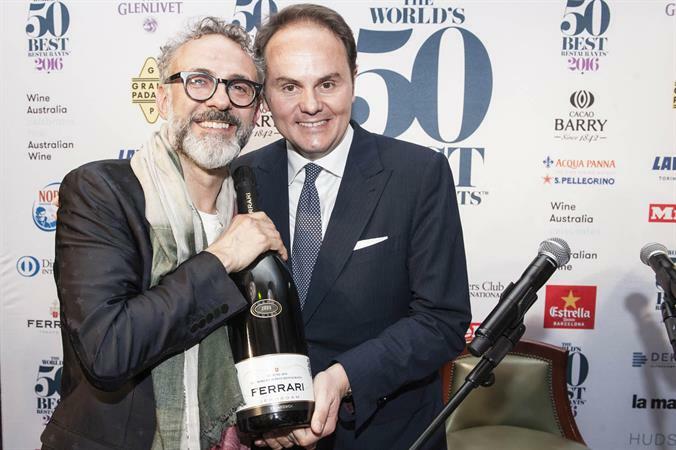 Massimo Bottura celebrated this historic moment for the Italian cuisine with a bottle of Ferrari, rising his glass for a toast with his wife Lara, his friends and colleagues. A success to be proud of as well as another confirmation of the bigger role that Italian bubbles play on the stage of the international restaurant industry. Today more than ever, Ferrari winery embodies the success of sparkling Italian bubbles, conveying the values of the unique Italian Art of Living that is taking the world by storm!